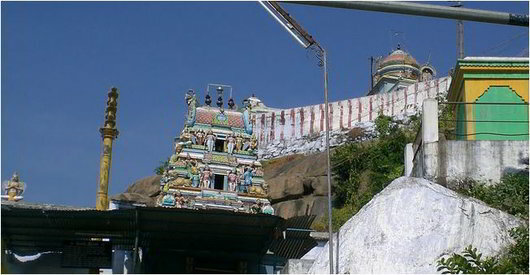 Avaniyapuram is located 20 kms from cheyyar and is on a small hillock. Steps can be easily climbed by even older persons also. 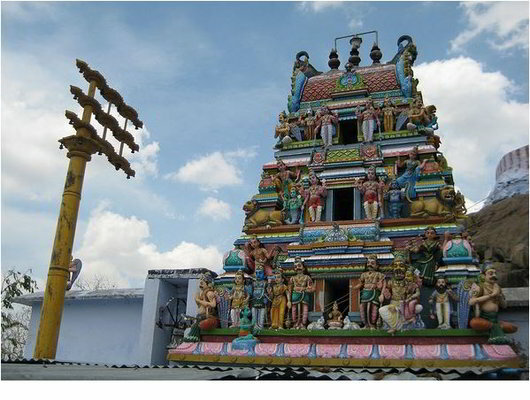 This is a two tire temple on the first entrance where moolavar is housed along with Thayar. 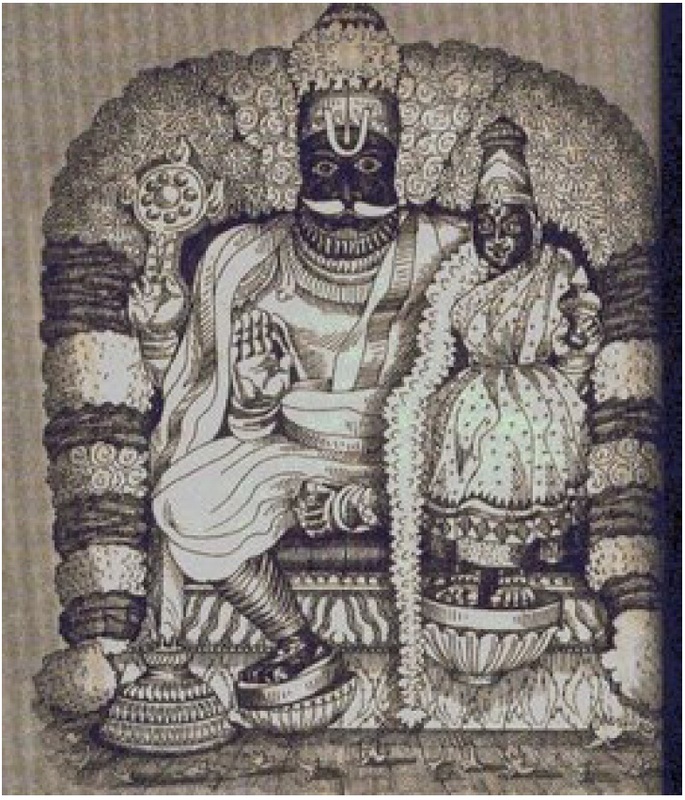 Lord Narashima is in a sitting posture, Mahalakshmi Thayar seated on his left thigh. His left arm is around his consort and his right hand is in abhaya hastha position. His upper hands are holding the chakra and conch. Here Lord has no face and Thayar having the Lion Face. The Uthsava moorthy of lord Narashimhar had a face of lion. 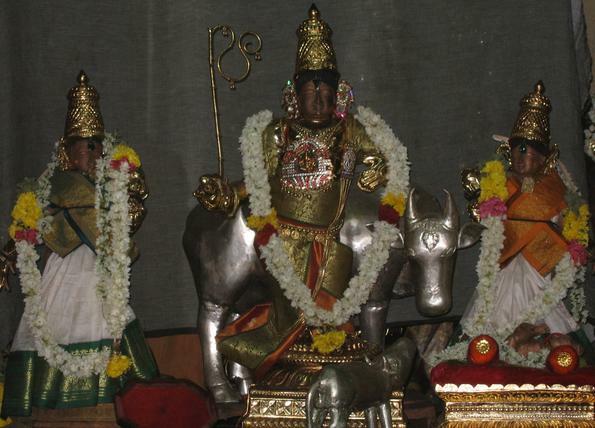 He has four hands and is in standing position flanked on either side by Sri Devi and Bhoodevi. On the Right side of the prakaram Pancha Narashimar separately in a row. Garudan in a Separate Sannidi. There is a “Pancha Narashimar” enclave. 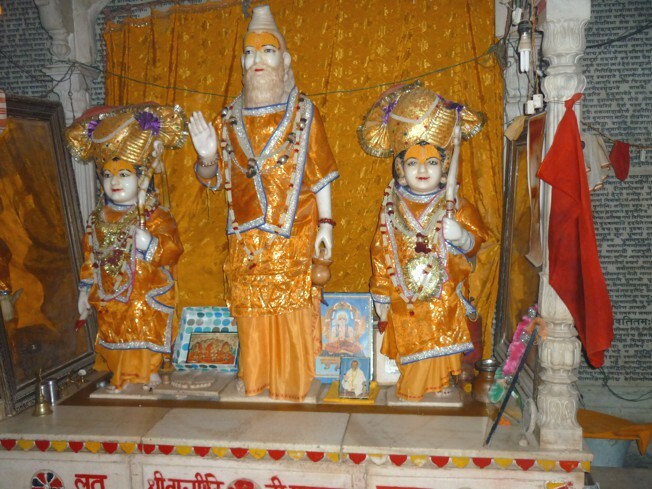 They are housed in a row along with Adhi shesha and Kalinga Nardana Krishna. 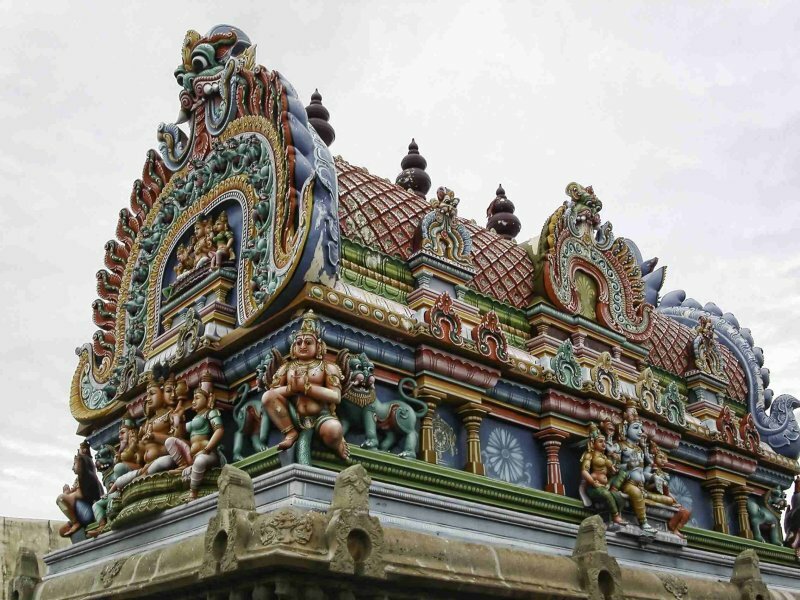 The most unique feature here – probably something that cannot be found anywhere else in the world is that not only does Lord Narasimha have the lion face, also the thaayar is found here with lion face. During the Sarvadhari Samvathsaram AANI month 9th day is the day Thayar got the lion face and it is celebrated once in 60 Years (hindu samvathsara cycle) in Sarvadhari Samvathsaram. Avani means lion in Sanskrit and hence the name ‘AvaniNarayanapuram and now is Avaniyapuram. During the time of Thretha Yuga Lord Brahma was doing the yaga and at that time from the yaga’s fire Lord Narasimha has appeared in front of him. Due to the heat lord doesn’t had the face when he come up. Seeing this Mahalakshmi Thayar told to Narasimhar that how you will give darshan to bhaktas without face hence please grant me your face to me. Pleased by the Thayar lord gives his face and hence in this Kshetra Thayar with lion face giving darshan to all and this day is celebrated once in 60 Years of Sarvadhari Samvathsarm Aani Month 9th day. Only on this day 4 types of nevedhya prasadam will be offered to lords of this hill temple. One more is, Lord Narasimha had given darshan to Brigu Maharishi in the form of five Divya desa deities viz Tirupathi Balaji, Sholingur Narasimhar, Kanchi Varadaraja Perumal, Srirangam Ranganathar, and the Ahobilam Nava Narasimhars. 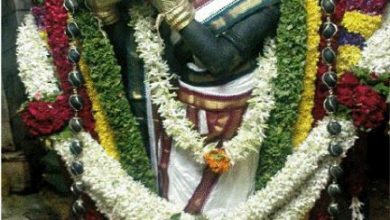 Similar to Tirupathi, where Lord Venkateshwara is in Tirumala and Alarmelmangai Thaayar is at Tiruchanur, here Lord Venkateshwara is in the first tier, while the thaayar is found at the lower tier. There are totally nine Narasimhars here (out of which five are in a row) like Ahobilam and hence is called Dakshina Ahobilam. Thus once can have darshan of all the main pancha divya desa moorthies – Ahobilam, Kanchi, Sholingur, Srirangam and Tirumala. There was a huge rock formation in the form of a lion with face, eyes, nose, mane and a raised right leg. Thulabharam prarthanai is practised here. It is believed that if childless couples pray to offer thulabharam, once their prayers were answered, their wish of childbirth is granted, and they come back with the child to offer gratitude. 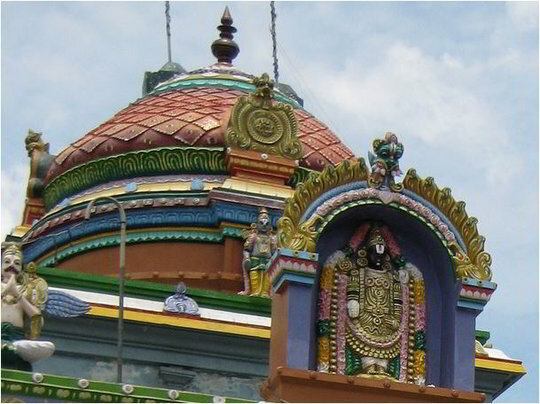 A small temple for Siriya Thiruvadi can be found in the mid-way while climbing steps. There are a lot of vanaras around here so extra caution is required with your hand bags and archanai materials. Route no 148 Chennai to Polur directly goes to temple. Stop Avaniyapuram koot Road. Need to walk to the temple for 2 km from arch . One more option from Chennai is to board Route no 104 Chennai – Vandavasi and from Vandavasi to Arani road 26th Km. Chennai – Kanchipuram – Cheyar – Valebandh koot Road – Avaniyapuram koot Road. Route no 59 from Cheyar and 241 from Kanchipuram along with Private travelers Renukambal and Rangaswami Buses. Can you please mark the location or route on google map? The articles on various sthalapuranams are extremely informational and inspirational. Would you be kind enough to publish the sthalapuranams of Srirangam, Thiruvananthapuram and Guruvayur ? I’m very eager to learn about the above kshethras. Keep up the good work and may God always be with you!! !